Cars are due October 20th, 2018. Racing will start the following week. Video and results will be posted the following Saturday, October 27th. The zombie apocalypse has begun and you need a ride. What would you drive? October’s feature race theme at D64 is the zombie apocalypse. Build the ultimate zombie apocalypse car. Now that may be different for each person and there are no hard and fast rules for what it should look like. Maybe it is a war machine with knives, guns, etc. Maybe it's a Mad Max style car. Maybe it's just a great getaway car. Maybe it’s the biggest, baddest SUV you’ve ever seen. Or maybe it's a camper that you can live in. 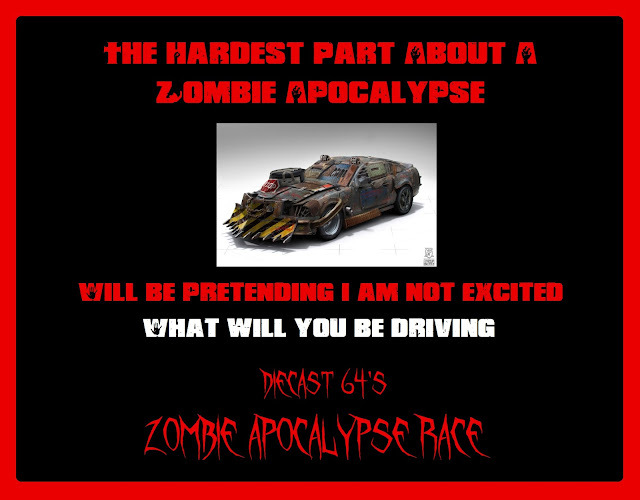 It’s up to you, but build your ultimate zombie apocalypse car and then make it fast! Because we’re racing them in October! Cars due October 20th, 2018. Racing will start the following week. Video and results will be posted the following Saturday, October 27th. In case you need a little inspiration, here are a few pics. Remember, have fun with this! Cars are due September 15th, 2018. Racing will start the following week. Video and results will be posted the following Saturday, September 22nd. Cars due September 15th, 2018. Racing will start the following week. Video and results will be posted the following Saturday, September 22nd.